Learn how to open .dat files. People often wonder how to open and read the mysterious dat files. Selecting program to open such files sometimes becomes big question. A detailed tutorial on this topic giving several methods of opening .dat files. Have you just received a .dat file and you don’t know what .dat file means? Well, you’re not alone! All over the world, a lot of people wonder how to open a .dat file. As you must have noticed, a .dat file does not have any recognizable icon —it simply shows a blank page icon in Windows. When you double click a .dat file, Windows asks you to select a program to open the file. But you don’t know which program will be appropriate to open such a file. In this article, I will tell you what is a .dat file and how to open and read it. I advise you to read the article thoroughly to fully understand the concept of a .dat file. Okay, so let’s first understand what is a .dat file. A .dat file extension represents a file that contains raw data. But isn’t that all the files contain just data? Yes, of course! All the computer files indeed contain some or the other kind of data. But, in Windows, file extension is used to show what type of data is there in the file and also to determine which application should be used to open the file. 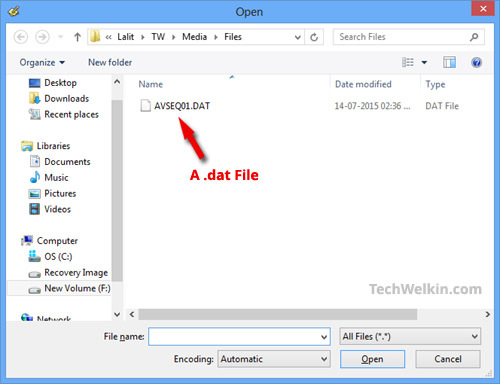 Example of a dat file in Open dialog box of Windows. For example, .avi, .wmv, .mpg file extensions represent files that contain video data and media players like VLC Player and Windows Media Player are suitable applications to open such files. Similarly .doc and .docx files are MS-Word documents and these are to be opened with MS-Word program. Here, you might ask a question —what would happen if we change the extension of a file? For example, if we rename a file from journal.doc to journal.dat, then what would happen? Well, the file will still contain an MS-Word document. However, now because the file does not have .doc extension, if you’ll double click on file, Windows will not know that the file needs to be opened with MS-Word program. So, it will ask you to select a program to open the file with. How to Know if You Have a DAT File? In a large number of Windows systems, file extensions are hidden from user view. So, all you’ll see the file name but not the file extension. As a result, it’s difficult to be sure whether you really have a .dat file in your disk. To make sure, you should change Windows settings and show the file extensions. For this, go to Windows Explorer > View Tab. In Windows 8 and above, you’ll find the chec kbox for File name extensions right in the View ribbon. Tick it to force Windows to show file extensions. 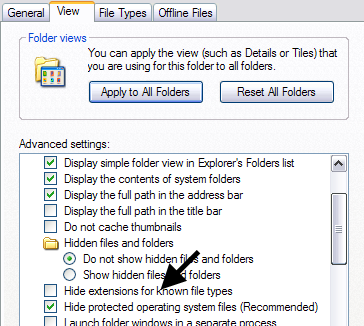 Show or hide file extensions in Windows 8. Show or hide file extensions in Windows. 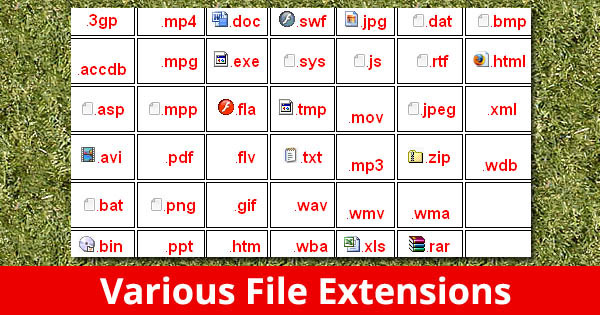 After taking these steps, all file names will be shown along with their extensions. Now you can confirm if you really have a .dat file with you. Why .DAT Files Are Created? Ideally, the program which generates a file should give a proper extension to the file. But sometimes, a program does not do so and simply give the generic .dat extension to the file. Technically this does not harm the file in anyway, but opening the file may become a bit tricky as neither the computer nor the user will know how to open the .dat file! What are the Common Examples of .DAT Files? It is common that VCD files (the files on a video CD) are named with .dat extension. The reason behind this practice is that these video files are not supposed to be opened by the user. Instead, the user simply needs to insert the VCD in the drive and the device will read the files. However, when these .dat files are copied from VCD to a computer disk, and a user directly tries to open them by double clicking, the computer would not know how to open the .dat file. Sometimes, email programs, like MS Outlook, also rename the attachments with .dat extension. At times, a .dat file may also contain plain text data if it was created by a data output program (e.g. statistical programs). These are just some of the common example of .dat files. In reality, a .dat file may contain just any type of data. How to Open and Read a .DAT File? If you’ve got a .dat file, the first thing you should try is to double click the file and see if computer can open it. If computer opens the file and shows the legible content —then there is no problem! If computer would not know how to open and read the .dat file, then it will show you the Open With dialog box and would ask you to choose a program. Open With dialog box in Windows. 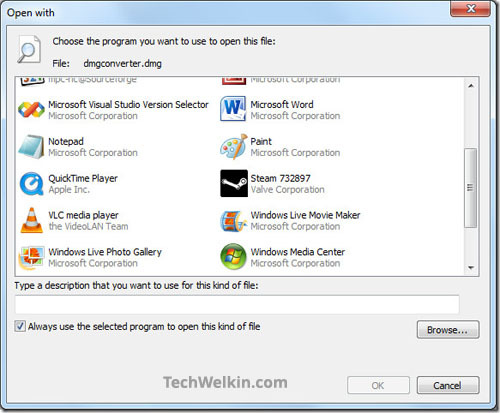 This dialog box asks you to select an appropriate program to open the file with. Question is, how to select the program to open a .dat file? Look at the size of the file (Right click > Properties). If file size is big (like hundreds of MBs) it is likely to be a video file. So, you should first select a video player program like Windows Media Player or VLC Player. If file size is between 5-15 MB, it could be an audio file. Try to open it with an audio player like Windows Media Player or VLC Player. If you have got the .dat file from a VCD, it is likely that the file will play in a video player program. If you’ve got the file through email… you need to be VERY cautious. Emails may contain malicious attachments. You must be careful before opening a .dat file received as attachment with an email. I would suggest that you shouldn’t open any such file if the email has not come from a trusted contact and if the email has not been scanned by an anti-virus software. If these easy tricks don’t work and you fail to figure out an appropriate to open the .dat file; then you would need to literally look inside the file and see if it throws a hint about it’s real content. Double click the file and select Notepad to open the file. You might see a lot of gibberish in Notepad. Carefully look for some hint that could tell about parent application for the .dat file. For example, in the image given below, I had opened a Adobe Photoshop (.psd) file in Notepad. As you can see, Notepad is showing that the file was originally created with Adobe Photoshop. Therefore, the best application to open the file would be Adobe Photoshop. A .dat file opened in Notepad. It shows the hint about the parent program. If opening with Notepad doesn’t tell you about the parent program, then you will need to take help from a Hex Editor. It may sound a bit geeky, but in truth Hex Editor is just a kind of Notepad. It can show you any file in Hexadecimal form and you can try to figure out the parent program exactly the way you tried in Notepad. 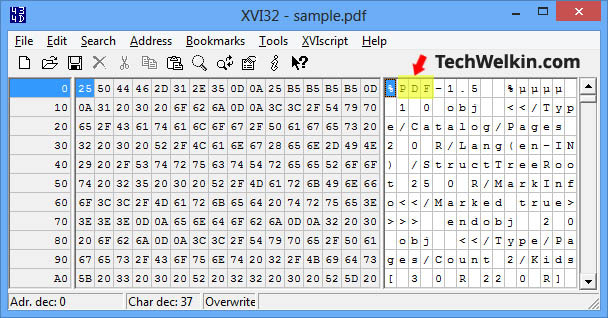 A good and easy to use Hex Editor for Windows is XVI32 (it’s free!). Just download it, unzip it, run XVI32.exe file and then open the .dat file in it. Chances are that you’ll be easily locate the parent program. For example, in case of PDF files, it tells you right at the beginning that it is a PDF document. A PDF file opened in Hex Editor. Once you know the parent program (i.e. the program that created the .dat file) you open that program and then open the .dat file in that program. For example, if .dat is turned out to be a PDF, open it in Adobe Reader. I hope this tutorial on how to open and read .dat files was useful for you. Should you have any questions about this topic, feel free to ask me through comments section. I will try to best to assist you. Thank you for using TechWelkin! Hi! I recently purchased a book (in German) “Die DDR im Blick der Stasi”; with it came a CD with a Windows research program on it …. full of .DAT files. No matter what i do, i cannot open them in Linux. I’ve followed the instructions above, even installed ‘tweat’ (hex program), but to no avail. The hex gave no hints, either. Any suggestions short of installing ‘wine’? a .dat file is created by foxpro application and it contains table. Please advice me how to open and copy the data in excel. Just try to extract the .dat file, basically .dat file act as a zipped file. Recently, I had downloaded Microsoft Office 2013 through torrent. It has a setup.dat file. What application should I choose to open it? I have no idea if anyone still is active here, but I have a .DAT file that was made in Adobe Photoshop, but It wields more than one image inside it, more than 20, as I have no idea what extension to use and no idea how to open it as I tried PSD, but it doesn’t work, So my conclusion is that it won’t work on a DAT with more than 1 image in it. I have a .DAT file that I know is a contacts list from Outlook 2015. I cannot find in the program were to open the file. I just need all the emails address and would be willing to open the file in word or excel and manually enter the contacts again. Any ideas of how to open the file in Outlook? or how to get a legible copy of the text from a similar application? Use free tool nk2 edit application it is very helpful for opening .dat file that contains contact list. I recently could not access my Mozy online back up. Their tech help said something in my computer was changing their .dat files to VCD type. I have no viruses, bots, malware — my computer was recently cleaned by a technician. I had to change to Carbonite. The Mozy tech said in her 15 years of IT experience she had never heard of that and the tech that worked with my computer said he had not, also. Have you seen this happen and how can I correct it? She wanted me to re-install Windows 7 OS, but we did not. Hi Jonathan, .dat files are tricky and there are no specific ways to open them. I have shared some of the suggestions on how to open .dat files. If none of these works, then I would be able to suggest anything more only if I get and analyze files. Hello, what can I do if DAT file encrypted? How can I extract models from it? Hello! There are no fixed solutions to open .dat files. In this article, I have explained some of the methods that you should try to open such files. How many types of .dat files are there?? .dat files could be generated by any number of applications. So, there is no fixed number of types of .dat files. I make a .dat file of payroll information to send to the bank. Somehow this type of file got changed to always open with Internet Explorer. How do I change it back to always open with nothing so it becomes a generic file to send to the bank? Hi Christi, the file does not change, it is the user’s preference of application to open .dat file that changes. In past, you must have tried to open a .dat file in IE by right click > Open With > Internet Explorer. Your computer has remembered that setting and assumes that you always would want to open .dat file in IE. It has nothing to do with the file. Your file is okey. You can send this file to the bank even if it is showing IE icon in your computer. As .dat files are generic files, computer would always ask the user about how to open it.